Chelsea Grizzelle, left, and Aaron Grizzelle, right, cradle and visit with their daughter, Gemma, in the UAMS NICU. Gemma's crib and the Angel Eye camera recently installed on it are visible to the left. 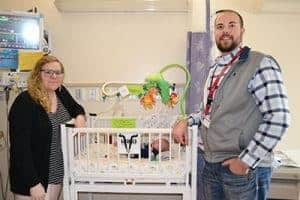 April 11, 2018 | April 11, 2018 | The UAMS Medical Center and Angel Eye Camera Systems, a company established in 2013 with support from the University of Arkansas for Medical Sciences (UAMS), recently installed 40 new camera systems in the medical center’s neonatal intensive care unit (NICU), making it the first in the state with a camera on every preemie bed. Using the Angel Eye camera system, parents can see their baby anytime, day or night, from their mobile phone or computer. Angel Eye represents not only the latest technology, but a total rethinking of how to provide patient- and family-centered care for parents and family members who are away from their babies in the NICU. The Grizzelles stand on either side of Gemma’s crib as their baby daughter rests underneath an Angel Eye camera, center. 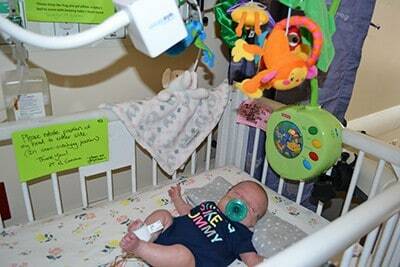 Before the recent installation, there were web-cameras on 26 of the 64 beds in the unit. Of the 40 new cameras, 38 are for existing beds, and two additional cameras are for future use. Gemma Grizzelle, a baby born prematurely in January, originally was assigned to a bed without the camera, her mother, Chelsea Grizzelle, said. Being moved to a bed with one was a positive change. 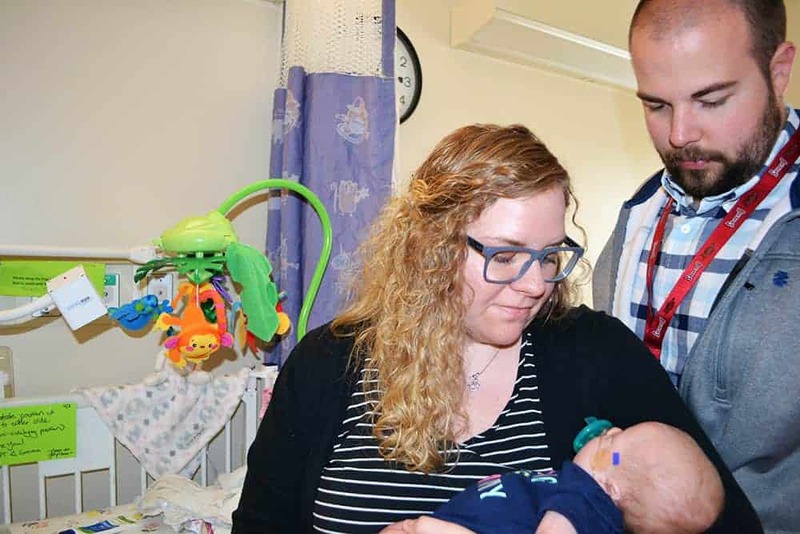 Chelsea’s husband and Gemma’s father, Aaron Grizzelle, was not able to visit their baby after her first week in the NICU, but he could check on her through Angel Eye. From 2011 to 2017, 1,356 families and 3,351 individuals within those families used the Angel Eye Cameras in the UAMS NICU. With the Angel Eye web camera over Gemma’s crib, the Grizzelles can check on her at any time via an internet connection. Headquartered in Little Rock with offices in Nashville, Tennessee, Angel Eye has installed its internet-based technology in 45 hospitals across the country with several pending installations. Angel Eye’s technology is an example of the nationally leading role played by UAMS ANGELS (Antenatal and Neonatal Guidelines, Education and Learning System), a program that uses the latest connected health technology to provide long-distance care to rural Arkansas parents and their newborns.